I love food and eating out. I really do. It doesn’t need to be fancy or expensive all the time, it’s just nice to grab my boyfriend, parents, friends, cousin or aunt every now and then and spend a couple of peaceful hours at a place that serves good food. That is why I have decided that I would only go out for special occasions and not just because I’m too lazy to cook. When a friend, who I haven’t seen in four years, asked to meet for a coffee (she was visiting Copenhagen) I immediately said yes. I’m really excited to share my experience of that day with you. We decided to go to a place called 42Raw. It is, as the name indicates, a café/restaurant serving food that has been heated up to a maximum of 42ºC (they do serve coffee, though), plus, as far as I can tell, it’s all vegan. In total, four of these can be found all over Copenhagen, however, the one we visited is located in the city center on Pilestraede. 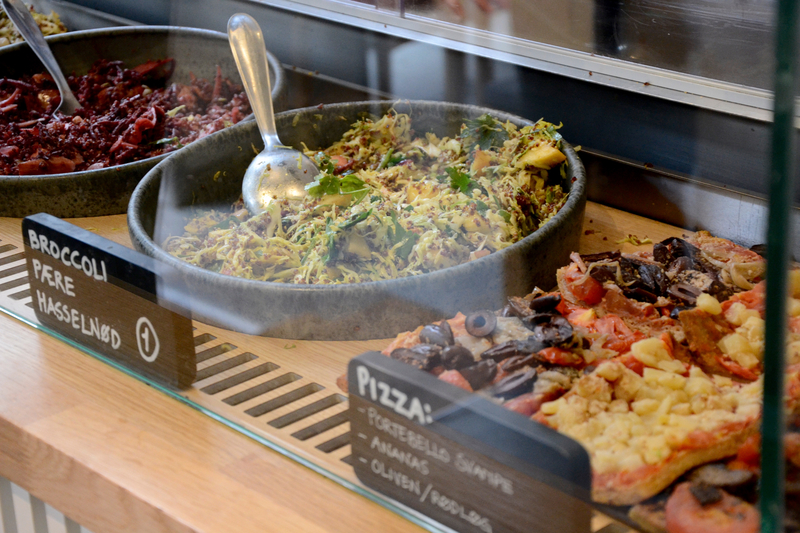 It offers breakfast as well as lunch, cakes and smoothies. The atmosphere is quite laid back, with four big tables to sit at and a very modern looking interior giving it the typical hipster vibe everyone is currently so obsessed with (I’m not complaining here). Both of us decided to try the Acai Bowl. 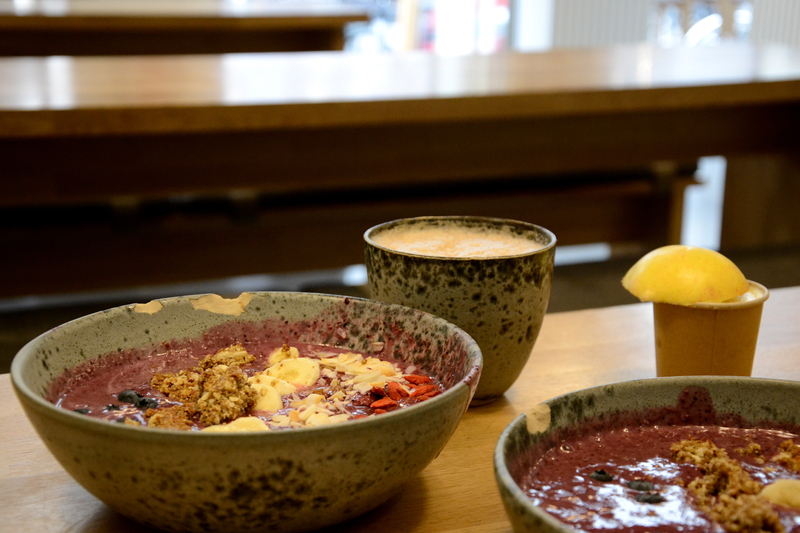 There seems to be a huge hype right now when it comes to acai bowls and until now I’ve been quite skeptical, as I imagined it to be nothing more more than a thick smoothie in a bowl. 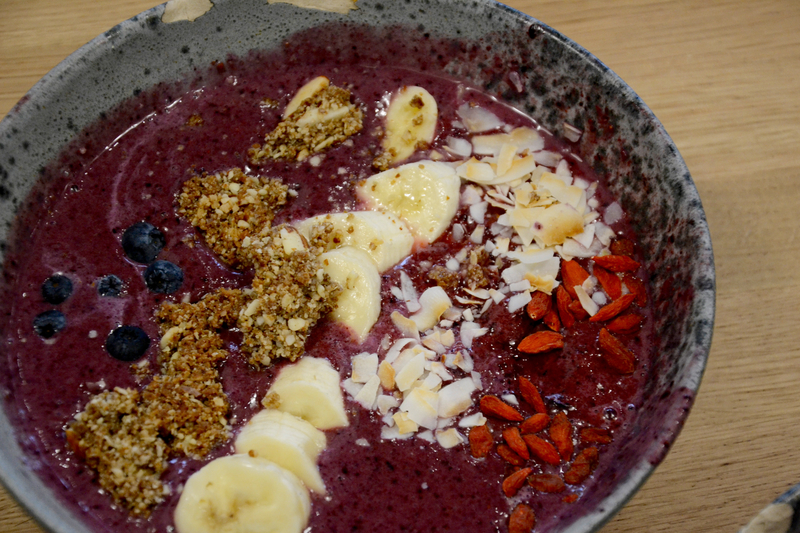 Well, it is a smoothie in a bowl, BUT it’s a delicious one topped with Goji berries, coconut flakes, bananas, blueberries and home-made granola. Yum! 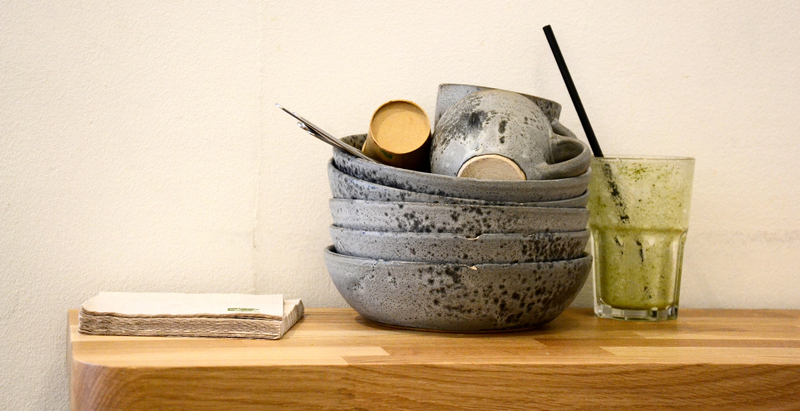 Unfortunately, the bowl could have been prepared with a bit more love. It looked slightly messy, especially when you compare it to the perfect bowls on their website. I believe it’s important to decorate dishes in a nice way in order for us paying customers to feel the effort. But that’s the only real minus point I can think of. As I wasn’t feeling well the last few days (caught a cold thanks to the rainy weather here) I decided to order a Ginger Shot (apple, ginger). I expected it to taste spicy but boy, I didn’t expect it to taste like pure ginger! They served it in a small paper cup (a “real” cup would have been nice), topped with a piece of apple that helped neutralize the intensity a bit. But hey, there’s nothing better to kickstart a weak immune system than fresh ginger. 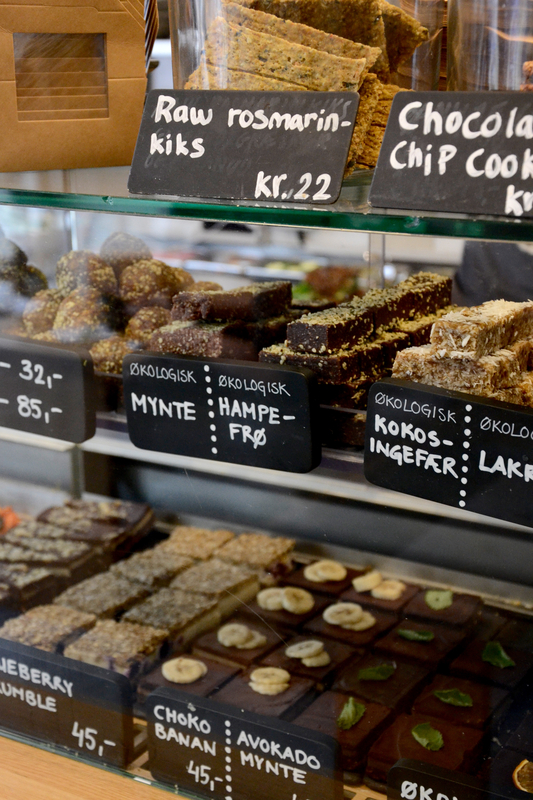 I can really recommend this place to anyone, even those of you who usually aren’t that much into vegan or raw food – I’m serious, you won’t miss out on anything. Next time I’m going to try the cakes. They look delicious! And at some point I have to buy their cookbook. It’s in danish, but that’s just the perfect motivation to learn a little bit of that awesome sounding sprog.